Ask any contractor what their number one most popular project is and they will likely say kitchen remodeling. This is probably because kitchen remodels offer the highest payoff in terms of family use and home value. 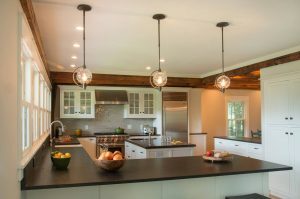 However, before you rush to change out those cabinets or add an island counter, here are a few things you should know about kitchen designs and renovations. Many homeowners dive into the kitchen redesign process without a clear plan and simply wait to see where the road takes them. This is especially true in the case of DIY remodels. However, a plan helps to ensure you stay on track and within your budget. Some contractors will take a look at your house and send you a design for your kitchen within a few days or weeks. However, accept this design with caution. Have you talked to the contractor about any of the following factors? If the answer is no, then as beautiful as the new kitchen will be, it may not meet your needs. Remember to ensure function takes as high a role as form. If you plan to upgrade your dishwasher, stove or refrigerator, be sure to let the contractor know. The size of these new appliances may require adjustments to the spaces currently allotted for your appliances and will also affect the design. Don’t want until the last minute to try to factor this in, or the stainless-steel double-door fridge you had in mind might not fit. From plumbing to special electrical wiring, the kitchen is the most likely home renovation project where things can go wrong. Hiring a professional is key to ensuring kitchen remodeling projects go as planned. As added protection for your investment, never hire contractors that are not bonded, licensed and insured.